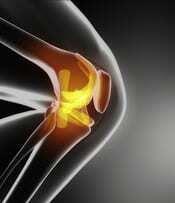 Osteoarthritis is a degenerative joint disease that can affect the knee. It causes the surface layer of cartilage to break down and wear away, and the joint's synovial fluid to lose its ability to lubricate. This combination causes pain, stiffness, limited joint motion, and inflammation in the knee. Osteoarthritis of the knee is often initially treated with pain relievers such as acetaminophen, nonsteroidal anti-inflammatory drugs and corticosteroid injections. However, these methods are not always effective, and can have adverse effects such as gastrointestinal problems, allergic reactions or kidney damage. It can take several weeks for patients to experience full symptom relief after hyaluronic-acid injections. Side effects associated with viscosupplementation are temporary, and include injection-site pain, swelling, redness and rash; bruising around the joint, or fluid accumulation in the knee. If these reactions occur, they are usually mild and do not last long. Viscosupplementation is most effective for mild-to-moderate cases of osteoarthritis, and may be a good option when osteoarthritis has not responded to conservative treatment with pain medication.